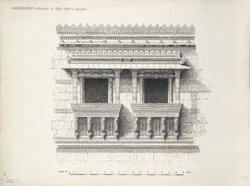 Illustration of the windows from Rani Sipri's mosque at Ahmadabad, in Gujarat from James Burgess' 'Original Drawings [of] Muhammadan Architecture of Ahmadabad.' The Rani Sipri mosque, built in 1514, is located in the south-eastern part of Ahmadabad near the Astodiya gate and was built for Rani Pirai, who was the mother of Sultan Mahmud Begada's son (r.1459-1511) Abu Bakr Khan. This elegant mosque is also known as Masjid-i-Nagira or Jewel of a Mosque. James Burgess quotes Mr Fergusson in the Archaeological Survey of India, Vol VII: "Notwithstanding the smallness of its dimensions...it may be considered the gem of Ahmadabad, and in its class, as one of the most exquisite buildings in the world."